Four persons who attempted to stowaway from the Tema Harbour to Holland to seek greener pastures have been apprehended by security operatives at the port. 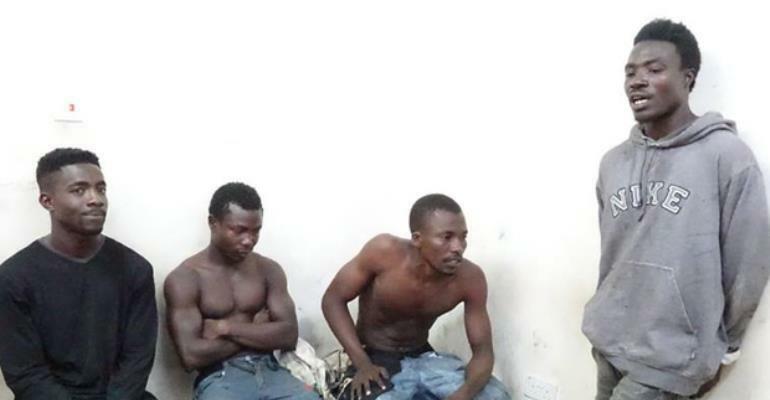 The suspects, whose names were given as Benjamin Aidoo, 21, Bernard Owoo, 18, Yussif Musah, 26 and Emmanuel Mensah, 22, were on board the vessel M/V AS Carelia at Berth 1 of Meridian Port Service. They were said to have been ferried on a boat from the Tema Fishing Harbour to the breakwaters at the Meridian Port Services, where they used a hook and bamboo-like device to move onto the vessels. A search conducted revealed items such as Gari, Fanta, water, paracetamol, rope, clothes, biscuits, glucose, among others. The four stowaways have been handed over to the Immigration Service. Lt Colonel Joseph Punamane, the Port Security Manager, explained that improved port security system will fish out any individual who would attempt to stowaway from the country's ports. The port security manager sternly warned people who might attempt to stowaway from the ports to avoid risky means of travelling outside the country but follow the due processes.